It's been 15 years since I last visited San Francisco. And one of the things I was not able to do then was to ride the famous San Francisco cable car. 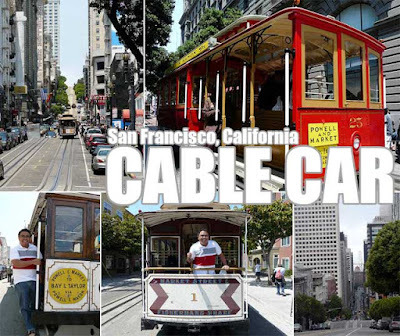 The San Francisco cable car system is part of the San Francisco Municipal Railway or Muni. It is said to be the last permanently-operational manually-operated cable car system in the world. We bought ourselves a day pass on the Muni for US$11 which gives holders unlimited use of the cable car and other lines of the Muni for a day. A single ride on the cable car will cost you US5$. It was indeed an experience, and an even better one if you're cool with standing at the sides. We took the Powell-Mason line from Union Square to Fisherman's Wharf where we were going to have a late lunch.